Such differences might lead to a rising tide that lifts all boats, but favors vessels carrying advantaged students. 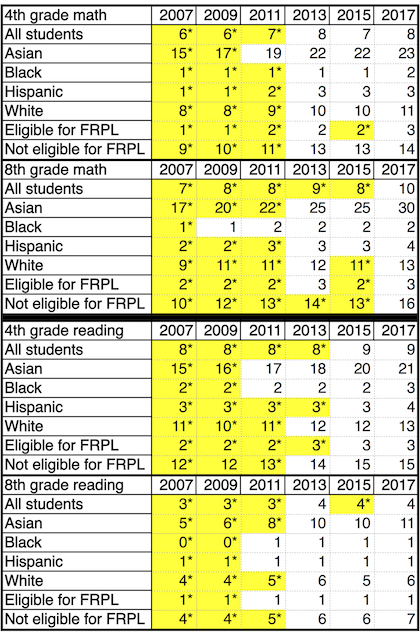 In Massachusetts, for example, America’s highest-achieving state, white, black, and Hispanic eighth graders reach NAEP Advanced at twice the national rate. But this again masks massive academic inequalities. Although one in every five white students is advanced, that’s true of just one in every twenty-five black and Hispanic students—a gap that is also twice what it is nationally. Meanwhile, a gifted program exists in just one out of every twentyMassachusetts elementary and middle schools, a lower rate than everywhere except Rhode Island and Vermont. And less than half of one percent of the state’s black and Hispanic students participate in such a program.